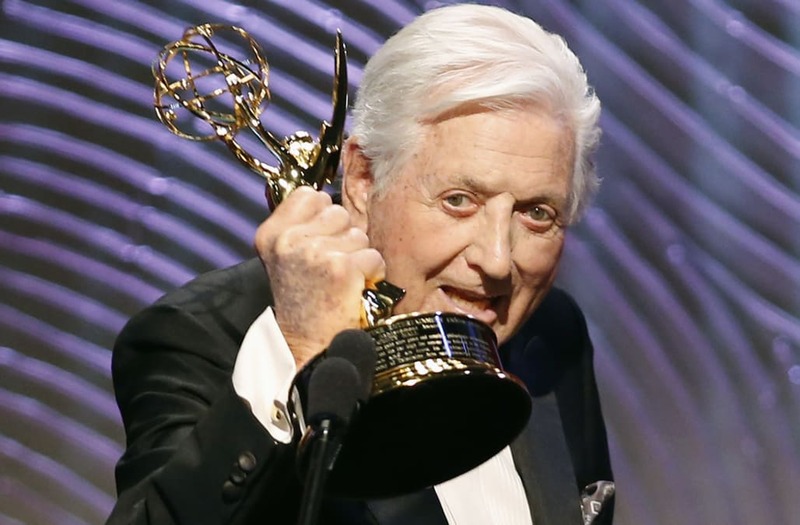 (Reuters) - Monty Hall, one of the most popular game show hosts in American television history as he presided over a throng of outrageously costumed and nearly delirious contestants on "Let's Make a Deal" for almost three decades, died on Saturday at age 96, his son said. Richard Hall said his father died at home in Beverly Hills, California, likely of heart failure. Members of his audiences, dressed as clowns, playing cards or giant tomatoes, would shriek "Monty, Monty, Monty!" as they tried to convince Hall to give them a chance to win a washing machine or a new Cadillac. Sometimes the prizes were a "zonk" - a gag gift such as a live donkey or a wrecked car. Hall was the co-creator of "Let's Make a Deal" and hosted more than 4,000 episodes from 1963 to 1986 (with occasional hiatuses) and then again in 1990 and 1991. The show drew good ratings even as it jumped from network to network and into syndication. "Let's Make a Deal" became a part of American pop culture, with Hall one of the most recognizable stars on TV. Hall also produced other game shows, hosted variety shows and appeared as a guest star on television series. He was known for charity work for organizations including Variety Clubs International, which raised money for disadvantaged children. "Many people know my father as an icon on TV but he was also a tireless supporter of charities that meant as much to him as his TV work," Richard Hall said by telephone from California. He was born Monte Halperin on Aug. 25, 1921, in Winnipeg, the son of a slaughterhouse owner father and an actress mother. After working in radio in Canada, he came to the United States in 1955. In the early 1960s, he was developing game shows and joined forces with TV veteran Stefan Hatos. They devised "Let's Make a Deal" in which Hall picked people from the audience to become contestants in sort of a trading game. Initially, audience members wore normal clothing but started wearing costumes and carrying funny signs to get Hall's attention. Hall would offer contestants a modest prize, then give them a chance to trade it for a mystery prize hidden by a curtain, stashed in a big box or concealed behind door No. 1, door No. 2 or door No. 3. That prize might be worth thousands of dollars or might be a "zonk" like a farm animal. Audience members jumped up and down, shouted, cried and kissed Hall when they won, and sometimes even when they lost. "In 4,700 shows, I got kissed 50,000 times," Hall said in an interview with a classic TV website. "Even when they lost, they were very nice about it. But you know the law in game shows - if you go on a show and you win a donkey, that's your prize. You're entitled to it." The show's producers showed mercy on the "zonk" winners, however. After the taping of the show, they would be offered a substitute prize, such as a television, and most would take it. "In 1 percent of the cases, they didn't," Hall said. "There was a time when a farmer won five calves and he wanted the calves. That cost me a fortune because when you rent them from the animal place, they're expensive." Other members of the show's team were studio announcer Jay Stewart and model Carol Merrill, who displayed the prizes. Hall made appearances on revivals of the show, including the version hosted by comedian Wayne Brady starting in 2009. In 1991, the New York Times published an article about what became known as "the Monty Hall problem" - a probability puzzle hotly debated by mathematicians centering on the advisability of switching choices when given options like those on his show. The conundrum was featured in the 2008 film "21" with Kevin Spacey. Hall was given a star on the Hollywood Walk of Fame in 1973. In 1947, Hall married his wife, Marilyn, who became an Emmy Award-winning producer. Their three children include Tony Award-winning actress Joanna Gleason.